CR&S (the acronym stands for Cafe Racers & Superbikes) was founded by Roberto Crepaldi in 1992. To vent to his “wildest” motorbike passions: the aim of the project was to sell classic bikes of the 1960s and 1970s, and to import, distribute, set up and tune special contemporary supersports models. The meeting with John Britten further fuelled his passion for extreme motor bikes: the CR&S Britten V1000 successfully competed in competitions throughout the world. CR&S had become a team. Following the death of John Britten, the CR&S team stopped its racing activities. A period of reflection and study followed, leading to the planning and building of the first prototype bearing the CR&S brand: a basic single-cylinder road bike built by RACECO in UK. Giovanni Cabassi and Giorgio Sarti joined CR&S in 2002 to share and support the “mono” project, which was to be made by Paton. In 2004, Roberto Pattoni, owner of Paton, became a partner in CR&S, as technical director. 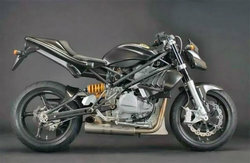 September 2004, Munich, Intermot: the CR&S “Vun” is officially presented. The CR&S Vun introduces a new category of motorbike: the “Mistostretto”*. For a bike of such new concepts, it is no surprise that any other category should prove rather constricting. It’s obviously not a supersports, nor a grand tourisme but nor is it a sport-touring, which is a sort of hybrid. But it’s not a custom bike either. Moreover, despite being a single cylinder, it is not an enduro, nor a supermotard, nor a retro. It might be naked, but this too is rather belittling, since naked bikes are supersports without the fairing or road-bikes weighing two hundredweight plus.